The Friends of the Howland Public Library will meet at 7 PM in the Community Room of the Howland Public Library. The Friends of HPL raise awareness of the library in the community and raise supplemental funds for special purposes. All are welcome! Beacon Reads Book Store at 307 Main Street has a new sign crafted by artist and former library trustee Gail Robinson for the Friends of the Howland Public Library. Christopher Ruhe, local author, teacher, and musician will be at Beacon Reads Bookstore at 309 Main St. on April 20th (Sat.) at 2 pm. His book, “SOLDIERING: Pioneering in Honduras, 1968-1973”, about adversities and joyous adventures in his adopted country will be available. Chris will be glad to talk about his book and sign any purchased books. Also he may play and sing songs from his time in Honduras. Part of the book proceeds will benefit the Friends of the Howland Public Library. Please come for an enjoyable literary experience on April 20th at 2 pm. I want to thank everyone who came out to support the Howland Public Library at our third annual Fabulous February Fundraiser on Presidents’ Day! It was a great success, and a wonderful indication of just how important the library is to our community. 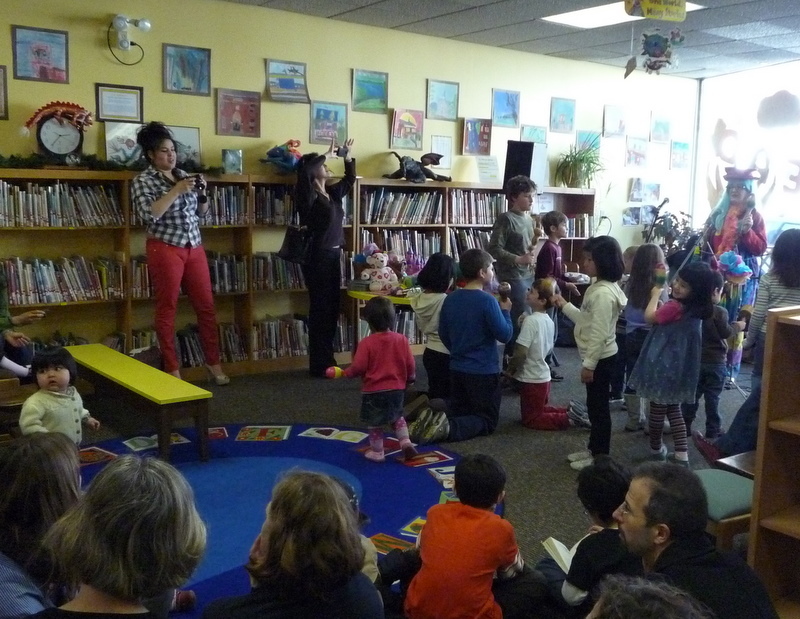 We were lucky to have several artist, authors, dancers, musicians, puppeteers and storytellers donate their talents to raise funds for our library. A huge thank you to Jonathan Kruk, Peter Ullian, The Rivertown Kids, The Tioronda Kids, Evan Pritchard, Studio B, Susan Lewis, T. Charnan Lewis and Angela Helland. Also, thanks to the organizations that came to support the library: Adams Fairacre Farms, Beacon Arts, Beacon Reads, Sargeant-Downing Gardens, Stonykill Farm Environmental Education Center, The Beacon Historical Society, The Beacon Theater and The Howland Cultural Center. Lastly, I would like to thank Vickie Raabin, Prudence Posner, Phyllis Keaton, the Board of FOHPL, the event volunteers and the library staff for their tremendous dedication to insuring our library’s success. The Friends of the Howland Public Library will present the 3rd annual Friends Fabulous Fundraiser on President’s Day, Monday, February 18th from 2 – 5 PM at the Howland Public Library, 313 Main Street, Beacon. The event is geared toward children and teens and will feature artists, authors, face painting, musicians, puppeteers and storytellers. 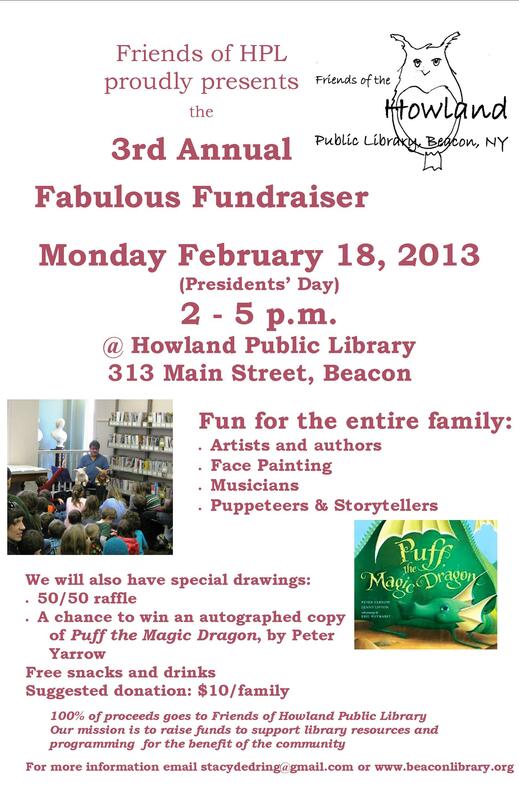 There will also be a special raffle, including a chance to win an autographed copy of Puff the Magic Dragon by Peter Yarrow. The cost is $10 per family, $5 per person, which includes complimentary snacks and drinks. All proceeds go to Friends of Howland Public Library. For more information email stacydedring@gmail.com. In recognition of National Friends of Libraries Week, Oct. 21 – Oct. 27, the Howland Public Library in Beacon wishes to thank the Friends of Howland Public Library for raising funds to purchase items for the library that are outside the budget voted on annually by residents of the Beacon city school district. With public library budget increases restricted to 2 percent or less, and with most of that increase eaten by mandated costs, supplemental Friends funds are more important than ever. Recent Friends purchases include new library tables, T-shirts for HPL’s winning teen Battle of the Books team, a historical-document scanner, a hanging system for our gallery spaces, an HDTV for programs, and coming soon — e-readers loaded with bestsellers. We couldn’t have purchased these items without Friends donations. Many thanks to Friends President Stacy Dedring, Vice President Elsa Franco and Treasurer Marion Imperatore; to Vickie Raabin for co-chairing the Friends Fabulous February Family Fundraiser; and to Marcia Frahman, Vicki Blucher, and the best bunch of bookstore volunteers ever! They’ve made the Beacon Reads Bookstore the success it is today. Finally, thanks to HPL Board Liaison Prue Posner, for helping the Friends attract and keep great people. Everyone in the community who has supported the Friends of HPL membership drive this year and in years past is a Friend of HPL. All Friends – those who volunteer and those who raise funds and those who write checks – make a real difference in our community. Friends of Howland Public Library is grateful for your past support of this important community space in Beacon. I am writing to invite you become a Friend or to renew your membership. 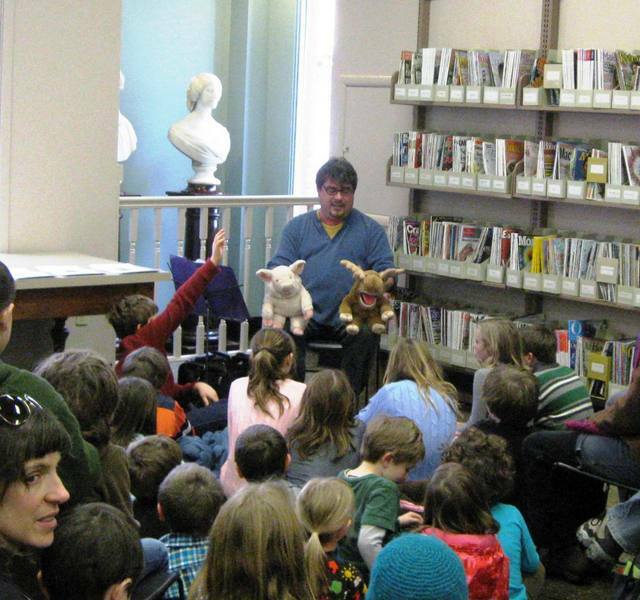 We are involved in many exciting projects at the library and as Friends, supporting the library in its activities. As you know, the library budget, like all public budgets at this time, is very tight, and it is thanks to the fundraising of Friends that some of the new equipment has been purchased. It is also thanks to Friends (and other library supporters) that our outstanding children’s and teen programs have been consistently funded. We hope you will also attend the Friends’ Annual Membership Meeting to be held on Thursday, October 11th at 4 PM in the HPL Community Room. I have agreed to continue as President of the Friends Board, Elsa Franco will continue as Vice-President, and Marion Imperatore will continue in her position as Treasurer. Marcia Frahman will be nominated for the post of Vice-President for Beacon Reads Bookstore. We invite nominations for the position of Secretary. At this meeting, we will also begin planning our Fabulous February Fundraiser for Presidents’ Day, Monday, February 18, 2013 from 3-5 PM at the library. Thank you in advance for continuing to support our public library through membership in Friends of Howland Public Library. We look forward to seeing you at the Annual Membership Meeting on October 11th. 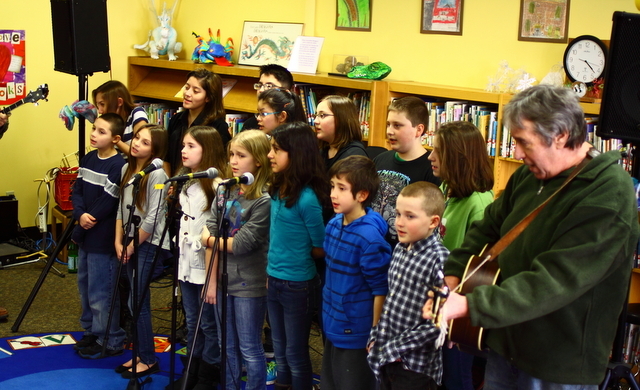 Rolling Players, The Beacon Children’s Choir, CharnanLewis and Kristie Nichole Phillipson . FOHL is also incredibly grateful to the businesses in Beacon that gave so generously to the event: Beacon Bagel, Hudson Beach Glass, The Cup and Saucer, Beacon Barkery, Mountain Tops, Barefoot Books, Play, Kringle’s Christmas House, Sukothai, Key Food, Global Home, Echo, Beacon Yoga Center, Gormedibles, Ballet Arts Studio, The Beacon Theatre, Max’s On Main and Miss Vickie’s Music. Please go out of your way to support the businesses that support our community! Finally, thank you to the unsung heroes that make the library work day in and day out: Director Phyllis Keaton, her truly amazing staff, and the Howland Library Board of Directors. A special thank you to Vickie Raabin for organizing the event. Thank you to the folks who came, both young and younger. Your energy, generosity and enthusiasm were infectious. If you didn’t have a chance to stop by this year, put it on your calendars for 2013!